s into mixtures of gravel, sand, and silt-sized particles with some clay. 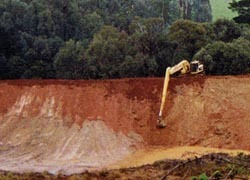 Eventually the gravel-sized particles may break down to produce a mixture of silica sand or silt particles and clay. k ‘sidewalks’ and heavy-use paths. It can be installed and compacted to meet handicapped accessibility specifications and criteria. In agriculture and gardening, mulch is a protective cover placed over the soil to retain moisture, reduce erosion, provide nutrients, and suppressed weed growth and seed germination. Organic residues: grass clippings, leaves, hay, straw, kitchen scraps comfrey, shredded bark, whole bark nuggets, sawdust, shells, woodchips, shredded newspaper, cardboard, wool, but also animal manure, etc. Many of these materials also act as a direct composting system, such as the mulched clippings of a mulching lawn mower, or other organics applied as sheet composting. We source this granite and mulch from our local quarry where loads can go from 3m2 to 50m2. Delivery is available at competitive prices.